Beach Glass Books, 9780998788128, 196pp. 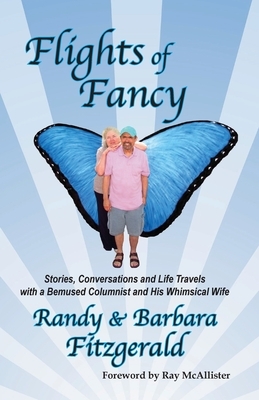 Award-winning columnist Randy Fitzgerald and his wife, Barbara, get the humor soaring in a new book, "FLIGHTS OF FANCY: Stories, Conversations and Life Travels with a Bemused Columnist and His Whimsical Wife," published by Beach Glass Books. "Flights," a $14.95 paperback, is a collection of columns and anecdotes shared by Randy – columnist for The Richmond News Leader, the Richmond Times-Dispatch and Boomer magazine – and Barbara – freelance writer and advertising/marketing expert. The couple long has been a favorite both in print and on the local lecture tour. Randy writes of the ordinary and the outrageous events in the life of one man's family, including an encounter with eight members of the British Royal family (yes, including the queen) on a London street and another with Willie Nelson in a Nashville parking lot. But did Randy also take his bride on a honeymoon to the Putt-Putt capital of the world? Did he flood his family's home to the tune of $13,000 in damages? And did Barb back the car over his Martin guitar? Did she get the couple's love story featured in Good Housekeeping magazine? Yes to all that and much, much more. Barb, his wife of 31, 46 or 56 years (it all depends on how you count) confirms and explains it all with her amused and amusing commentaries. Dozens of photographs and Douglas Payne illustrations enhance the stories. "Flights of Fancy" is perfect for your handbag or beach bag, anyone’s holiday stocking, your favorite end table or even the bathroom. Count on it being picked up – and the laughs to ensue. Find it in local stores or at www.BeachGlassBooks.com. Meanwhile, Randy also was teaching at The College of Charleston, Virginia State University, and the University of Virginia, and headed up the English and journalism departments at Virginia Union University. For 23 years, he was director of public relations at the University of Richmond. Barbara Fitzgerald has had a long career as a college professor and a writer, with projects as varied as a “small book” on U.S. Ambassador Alexander Weddell, commissioned by the Virginia Historical Society; advertising copy for Seiko, Kimberly Clark and more than 2,000 other clients; and an award-winning magazine interview with Lily Tomlin. After teaching English at the University of Georgia and The College of Charleston, in 1990 Barbara founded her own marketing, copywriting and PRshop, WordsWorth, in Richmond. Randy began writing columns for The Richmond News Leader in the 1980s, moved over to the Richmond Times-Dispatch when the papers merged and still writes for Boomer Magazine. He’s written for other publications along the way because he always seems to have a story to tell, and they’re usually funny. Sometimes hysterically so. He’s written about a variety of topics over the years, but his specialty is real life — as in the real life of his family and friends. As a friend pointed out, Randy has a knack of recognizing the joys of life that aren’t associated with having a bunch of money or status. He also is unafraid to poke fun at himself for mistakes he’s made — such as the time he planned their honeymoon around a trip to Fayetteville, N.C., the birthplace of Putt-Putt. (In his defense, Randy is a two-time Richmond Putt-Putt champion.)"